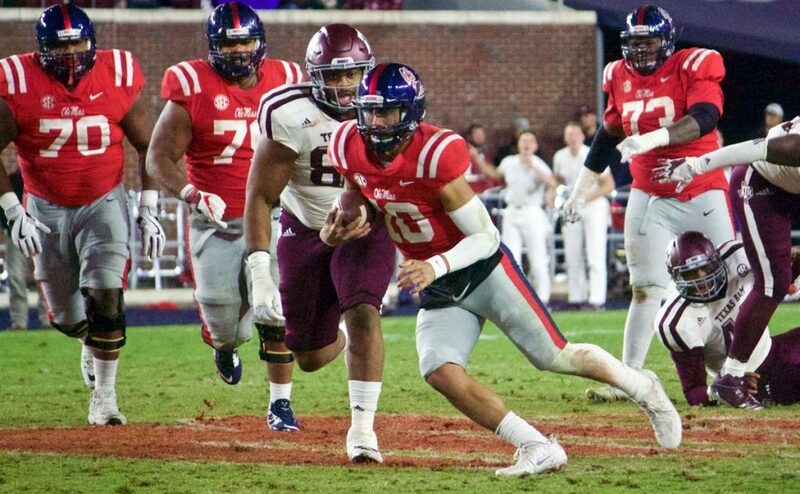 Ole Miss lost a third-straight SEC game on Saturday, falling to Texas A&M by a score of 38-24. The Rebels are far removed from a 5-2 record after a comeback win over Arkansas, now sitting at a record of 5-5. The flow of the game in College Station was eerily similar to last week, minus 22 total points. The Ole Miss offense was not perfect at any point, but big plays led to 14 points. DaMarkus Lodge, A.J. Brown, Octavious Cooley and Elijah Moore made plays. The final product seemed to be missing for most of the game. The Aggies’ coverage became an issue for the Rebels in the second half. The first half was a perfect display of the differing offensive styles between the teams. The Aggies ran 40 plays from scrimmage, methodically moving the ball up and down the field. Their offense put up 199 yards for an average of about five yards-per-play. Using a system that relies heavily on Trayveon Williams’ ability to gash defenses, the Rebel defense limited the A&M rushing attack to 2.2 yards-per- carry. Mohamed Sanogo was once again the key cog for the Ole Miss defense. He was at the middle of everything before the half. He added nine tackles and a tackle-for-loss. The Ole Miss offense found a rhythm towards the end of the first quarter. After failing to run the ball effectively at the start, the balance returned. Scottie Phillips left the game injured early, but his replacement stepped up. Woullard was able to move the sticks a few times, allowing Phil Longo to stay committed to the run. The big-play passing attack accounted for most of the offense. DaMarkus Lodge had two catches over 40 yards, and A.J. Brown added in a 39-yard catch-and-run. The third quarter had a clear effect in the game. Ole Miss only possessed the ball for 3:57 of game-time in the quarter. The offense did not convert a first down in the quarter. The only points in the quarter came from the defense. On its first drive of the half, the Aggies came out of the half looking to be the aggressor. Trayveon Williams started to turn those short runs that he had in the first half into big gains. The junior totaled 228 on the ground for the day, enough to take him over the 1,000-yard markin a season for the second time in his career. The Aggies looked to take a 7-point lead deep in Ole Miss territory. Kellen Mond fumbled on a quarterback run at the four-yard line. Zedrick Woods recovered it and returned it for a 96-yard scoop-and-score. The defense answered again on the next drive with an interception by Ken Webster. The spark needed to put distance between the Aggies and the Rebels was there, but the offense dropped the ball. Matt Luke acknowledged the effort that his defense played with today. Third-down efficiency, or lack thereof, held the offense back. The team successfully converted a third-down once out of 11 tries, and the one was when the game was out of reach. The biggest failure to convert came in the third quarter when Brown and Ta’amu had connected for 14 yards and a first down. However, the play was negated by targeting call that stemmed from a blindside block from Dawson Knox. Not only did Ole Miss have to punt, but Knox will miss the first half of next week’s matchup against Vanderbilt due to the targeting call against him. Lost in a disappointing finish was A.J. Brown’s historic day. With his performance today, the Starkville native eclipsed the 1,000-yard mark again. Also, he became the program’s leader in career receiving yards. The defensive woes are well documented. The group is completely depleted of any resemblance of depth. Today, not only did the defense keep the offense in the game, the defense was the reason the game was winnable going into the fourth quarter. When the offense went anemic, the defense answered the bell for three quarters. Trayveon Williams became too much of an issue, and the game was settled.